The Community Care Advocacy (CCA) Program is an innovative effort to integrate legal and social services in order to achieve better outcomes for clients. The goal of the CCA Program is to promote client well-being through supportive services such as education, linkages to community resources, safety planning, and court accompaniment. LACLJ believes that clients who have supportive services like these are better able to participate in their legal case and take maximum advantage of broader systems of care. Advocates educate clients on many topics, including the dynamics and effects of domestic and sexual violence, trauma, and PTSD, as well as coping techniques, problem solving, and resume development. The purpose of this education is to empower clients with the knowledge and tools they need to make informed decisions to address their circumstances. Advocates provide clients with information about community resources and make direct referrals for services such as shelter, counseling, healthcare, food and housing assistance. When possible, the Advocate connects a client directly with a staff member from the service provider in order to facilitate direct and expedited assistance. Advocates assist clients with safety planning. A safety plan is a practical, personalized strategy that addresses ways to remain safe in dangerous situations. Safety planning is especially important for clients who are survivors of domestic or sexual violence, whether they have left, are planning to leave, or are living with an abusive person. Through safety planning, clients make preparations to protect their physical safety, their children’s safety, as well as their property and finances. Advocates provide emotional support before, during and after proceedings such as restraining order and other family and criminal court hearings, as well as mediations, and interviews with law enforcement. Clients who are survivors of domestic or sexual violence often request support when proceedings involve facing the person who has harmed them. Advocates may help clients come to terms with court procedures, identify safety measures, and provide post-hearing support. Become a CCA . . . The CCA Program is a unique training opportunity for future social workers. During the school year, the Program is staffed by MSW student interns who apply through their MSW programs to have LACLJ as their field placement for either their foundation or concentration year. 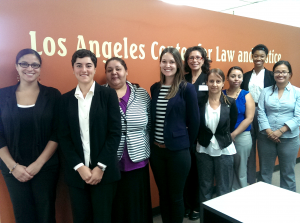 LACLJ’s Human Services coordinator, a LCSW, serves as supervisor and field instructor. LACLJ also offers a full-time summer CCA internship for MSW concentration-year students and recent MSW graduates who are seeking hours toward licensure. Summer interns receive a 40-hour domestic violence counselor certificate, in-service training on trauma-informed service provision and best practices for working with survivors of interpersonal violence, as well as a stipend to assist with educational expenses. For more information on applying to the CCA program, contact the social work field liaison at your respective college or university.